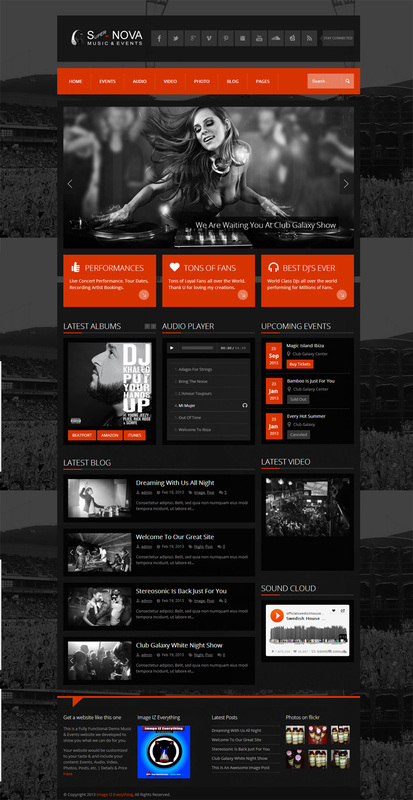 Description: Custom Development of a Music / Events Website. The Perfect website for any: Music Manager / Concert Promoter / Music Events / Music Booking Agent / Recording Artist. Your website would be customized to your taste & color scheme, and include your: Events, Audio, Video, Photos, Posts, Articles, Tour Dates, and any other type of content you’d like to display. Click HERE to View a Live DEMO of this Music / Events Website. Blue, Light Blue, Dark Blue, Orange, Light Orange, Dark Orange, Green, Light Green, Dark Green, Red, Light Red, Dark Red, Yellow, Light Yellow, Dark Yellow, Gray, Light Gray, Purple, Dark Purple, Violet, Crimson, Cyan, Pink, Brown, Olive.